Diva Musicals have put together these programmes, all based on musical themes and requests. Whether you want to join in and sing along or sit back and listen to beautiful melodies ...the choice is yours. Whether it’s a Birthday you’re celebrating, an Anniversary, or just a good old fashioned get together. Let us know the type of party that you’re planning and we’ll help to organise the music accordingly, from beautiful piano music and a string quartet to a fun filled sing along or dance band. A Rousing Celebration of music and memories. Patriotic, nostalgic, a tribute to those unforgettable songs of yesteryear. Whether celebrating St Georges Day, or your own Proms in the Park, let us join you in a rousing patriotic celebration, Rule Britannia, Land of Hope and Glory, Jerusalem. A nostalgic heart warming trip down memory lane, with songs that enriched and inspired a Nation. A Celebration of Love and Romance. Presenting the greatest love songs of all time. A heartwarming evening for lovers everywhere. Let dreams of the future and memories of the past go hand in hand as we embrace an evening of popular romantic love songs both old and new. Enjoy the music from Matt Monroe to Mario Lanza; The Rose, When I fall in Love and Phantom of The Opera. for so many wonderful songs and ballads. Share with us beautiful, timeless melodies. to any corporate or prestigious fundraising event. Enjoy an Evening of timeless classics, stunning voices and beautiful melodies. They tailor their performance to suit any event and guarantee a memorable evening of sheer delight. as they present songs from the world of opera and operetta as well as show stoppers from the world of theatre and film, along with many new arrangements of popular classic melodies. Enjoy a wealth of timeless popular classics. and a “Fabulous Night” for the Gentlemen too. Take a Stroll down Memory Lane with us. Share beautiful timeless melodies that recall so many precious memories. Songs from a Golden Era that we all know and love. gloriously happy time. Get together with friends and family and join in with a host of songs that we all know and love. And of course, some of those best loved Christmas songs and Carols. Imagine... Chestnuts roasting on an open fire as we take you through a Winter wonderland of Seasonal Songs and well loved favourites. Enjoy a truly magical evening with some of the loveliest and best known songs from the Great Classic Musicals of our time. A tribute to the West End and Broadway. 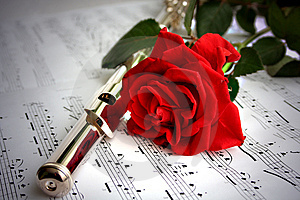 Enchanting melodies full of Passion and romance. Relive the Magic of those wonderful Musicals. Iconic moments of Film History encapsulated in a programme of Musical themes and melodies. Glorious melodies that brought wonder and magic to the silver screen. Enjoy The Warsaw Concerto,Legend of the Glass Mountain,Gone with the wind, and Mamma Mia. Join us in the 19th Century Halls of Old Vienna, waltzing the night away to the music of Franz Lehar and Johann Strauss. Beautiful songs full of sparkling gaiety and lilting melodies that rekindle an age of timeless elegance and glamour. You Are My Hearts Delight, Merry Widow Waltz,Vilia and The Blue Danube. A wonderful tribute to a City and her Songs. when lavish spectacular romances filled the West End with enchanting melodies. to the Romantic Melodies of Strauss, Lehar and Novello. Songs That Inspired and Enriched a Nation. songs of the 30’s and 40’s. Rekindle memories of days gone by when people shared a great spirit of comradeship and never missed the opportunity to have a good old sing song. This is certainly an opportunity to fly the flag and enjoy yourself. I’ll be Seeing You, White Cliffs of Dover, My Old Man,You Made me Love You , We’ll Meet Again. with classical wedding singers and musicians. 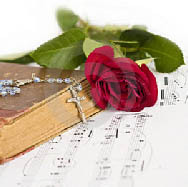 Include a beautiful song at the ceremony, enjoy music at the Wedding Reception and plan the Evenings Entertainment. We take genuine pleasure in helping you to discover the music that will make yours a perfect wedding. 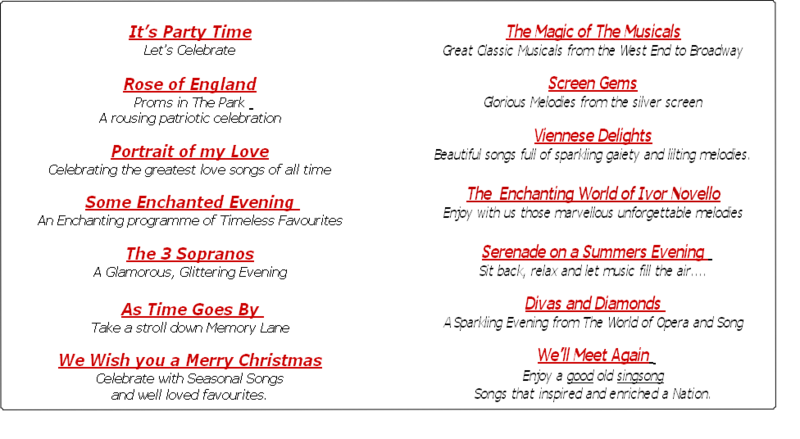 Here at Diva Musicals we’ve put together this selection of parties and themed evenings from which to chose. Private Parties and Functions, and are happy to organise entertainment for you according to scale and budget.